Destination weddings on the southern Vietnamese coast. 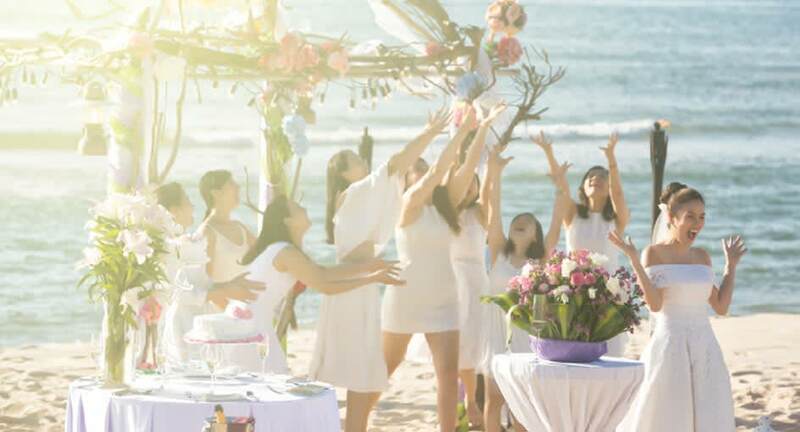 Choose from the most charming beach wedding venues in Vietnam. Anantara Mui Ne is blessed with a wide stretch of golden sands fronting the resort. Drift ashore in a round coracle boat, then exchange vows overlooking the ocean. Banquet on fresh seafood al fresco, then move to the ballroom for dancing and Champagne toasts. A dedicated wedding planner takes care of all the details, from invitations and wedding party transport to décor, catering and music. Picture your dream wedding, and we bring it to life. Soft, golden sands play host to wedding ceremonies, celebratory cocktails and banquets. Our L’Anmien Ballroom is an elegant canvas allowing your creative inspirations to become a reality. Fashion a wedding you will never forget by personalising the décor and floral arrangements. Ideal for up to 170 guests, or 100 banquet style. An al fresco space overlooking the ocean and free-form pool, perfect for cocktails and dining. Ideal for up to 80 guests.